Dashboard gas gauge arrows: What do they indicate? The second entry in a new occasional series examining mysterious or overlooked objects in our visual landscape. If you would like to suggest an object for the series, see the email address provided at the bottom of this post. Last time we investigated some mysterious wires you may or may not have seen strung above you on city streets. Today we’ll examine something most readers will have looked at for hours—but not necessarily noticed. It’s on the instrument panel of a newish car. Along the arc between the F and E is a symbol for a little gas pump. To the left of it is an arrow. What’s it for? a) The arrow indicates the direction that the dots move from empty to full. Most gauges and dials—think your radio volume, for example—work in the opposite fashion: full/more is to the right, empty/less to the left. While F and E would seem sufficiently explanatory, car manufacturers further clarify the matter with an arrow, lest drivers get confused. b) The arrow indicates where the car should go relative to the gas station pump. In other words, if you’re driving this car, you should park to the left of the pump when you pull in to fill’er up. 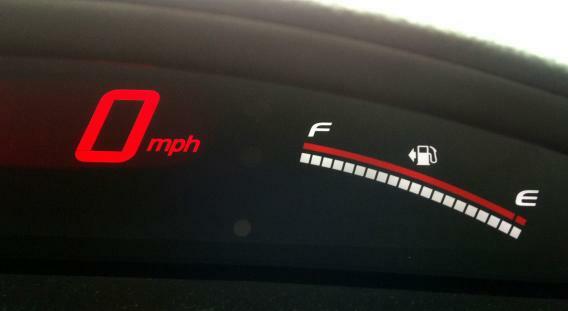 … c) the symbol means the filler cap is on the left side of the car. What’s more, this little arrow is on nearly every car sold in the U.S. in the last few years. Tom Mutchler, a senior engineer for Consumer Reports, says that the “vast majority” of new cars have this arrow—even the Porsche Panamera (manufacturer’s suggested retail price: between $75,200 and $173,200) and the Mini Cooper Countryman, automobiles that you won’t find on a typical rental lot any time soon. And yet many drivers don’t seem to be aware of this innovation. In my informal survey, about one in ten drivers said, “Well, duh,” or some variation thereof. But those knowing drivers seem to be in the minority: Colleen McCormick, PR manager for Zipcar, calls the dashboard arrow “one of the best-kept secrets” in the automotive world. One hopes it won’t be a secret much longer: Next time you visit the gas station in a vehicle you’ve rented, borrowed, or carjacked, just look at the dashboard. Whichever way the arrow points, that’s the side of the car with the filler cap. If you see something, say something: Send me an email to suggest future entries for What’s That Thing.